U.S. Sen. Thad Cochran, R-Miss., waves to supporters and volunteers at his runoff election victory party. Tuesday night, Republican Sen. Thad Cochran defied the polls and defeated tea party challenger Chris McDaniel in the Mississippi Senate primary runoff by a 51 percent to 49 percent margin. Cochran couldn’t have done it without expanding the pool of voters, and in the last three weeks he did just that. We know turnout was higher in the runoff than it was in the initial primary. About 375,000 voters showed up Tuesday compared with 318,904 on June 3, an increase of more than 17 percent. Cochran raised his vote total by more than 38,000 votes, while McDaniel pulled in only an additional 30,000. That was more than enough to erase McDaniel’s 1,386 vote lead in the first round. Cochran’s campaign explicitly tried to increase his turnout in the runoff by bringing Democratic-leaning African-Americans to the polls. Mississippi primaries are open, so all voters were welcome on Tuesday so long as they hadn’t voted in the Democratic primary three weeks ago. But does that effort explain Cochran’s success? It’s still too early — after the vote and in the morning — to definitively answer this question. We’ll need to look at the profiles of the individual voters, post-election surveys and precinct-level data. Until then, we have county-level results to go on, and that data suggests that traditionally Democratic voters provided Cochran with his margin of victory. Take Hinds County, where African-Americans make up 69 percent of the population, as an example. Cochran increased his vote total there by about 7,000 votes from the first round of the primary and his share of the vote by a little over 6 percentage points to 72 percent on Tuesday. We can also see what would have happened had there been no increase in the number of African-American or Democratic voters in the runoff, but it’s going to take some math. I ran two separate regressions on Cochran’s and McDaniel’s vote totals while accounting for race. The first looked at whether Cochran’s runoff vote total could be explained by a combination of his vote total in the first round and the racial makeup of each county. The second did the same for McDaniel. The regressions initially tell the same story as the charts above. 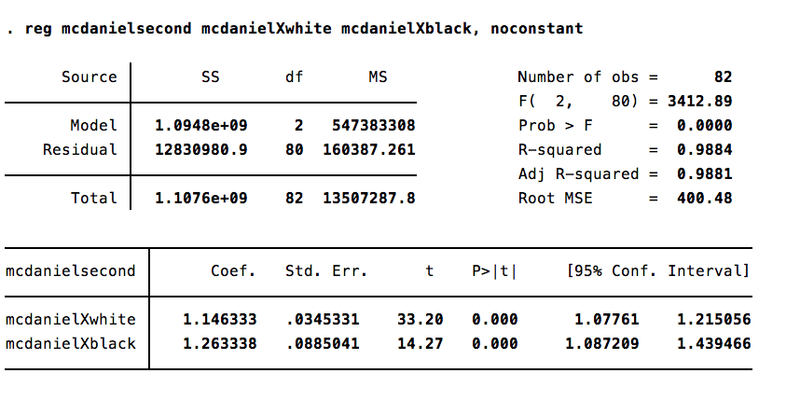 For Cochran, we see that the coefficient (“Coef” in the Stata output below) on the African-American percentage variable is more than double that of the non-black variable. 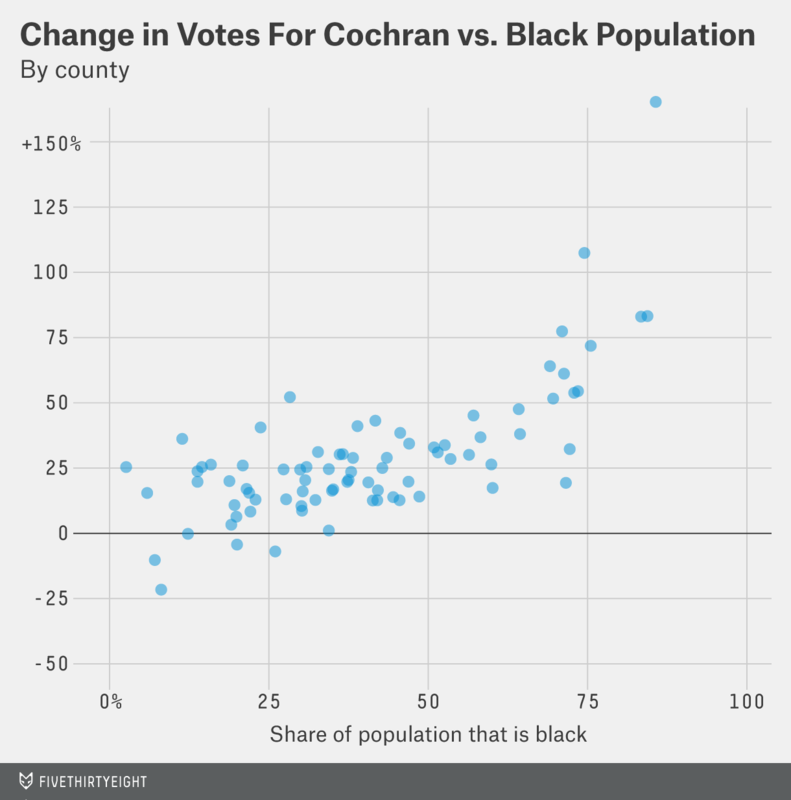 This means that Cochran saw a much larger increase in his vote totals in the areas where African-Americans make up a larger percentage of the population. 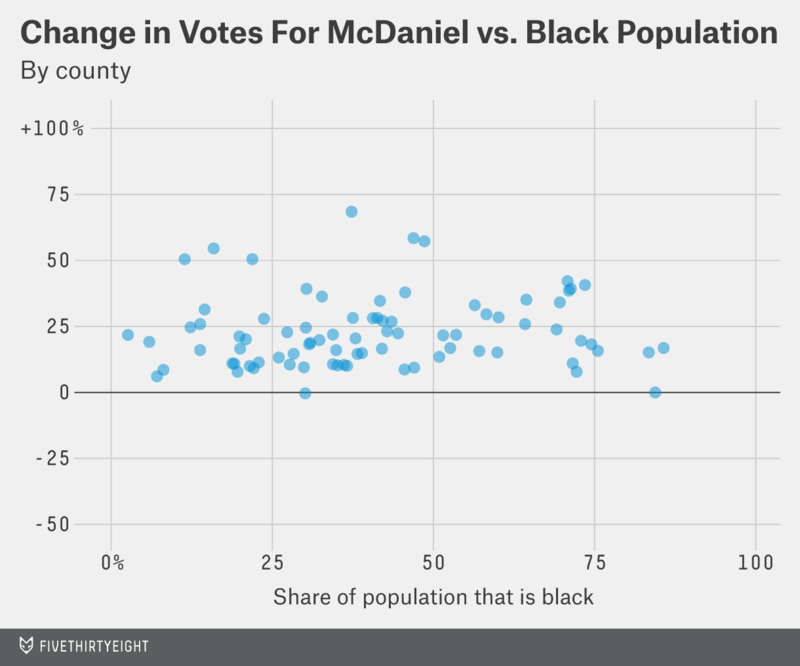 For McDaniel, the coefficients are pretty much equal, which indicates that you can’t explain McDaniel’s vote total increase by the share of African-Americans in each county. We can do more with these regressions, though. We can hold the African-American percentage of the population variables constant in both the Cochran and McDaniel regressions, while adjusting the non-African American variables. This process mirrors on a county level what would happen if white or traditionally Republican turnout went up but black or traditionally Democratic turnout didn’t change from the first to the second round. In my scenario, I kept the African-American turnout constant from the first round of voting, but let the white vote increase as it actually did. Keep in mind, though, that the pre-election polls had McDaniel ahead by around 8 points. It seems plausible that the reason they got the race wrong was because they were modeling an electorate that looked a lot more like the first round of the GOP primary instead of the runoff. That certainly makes sense given what I found. 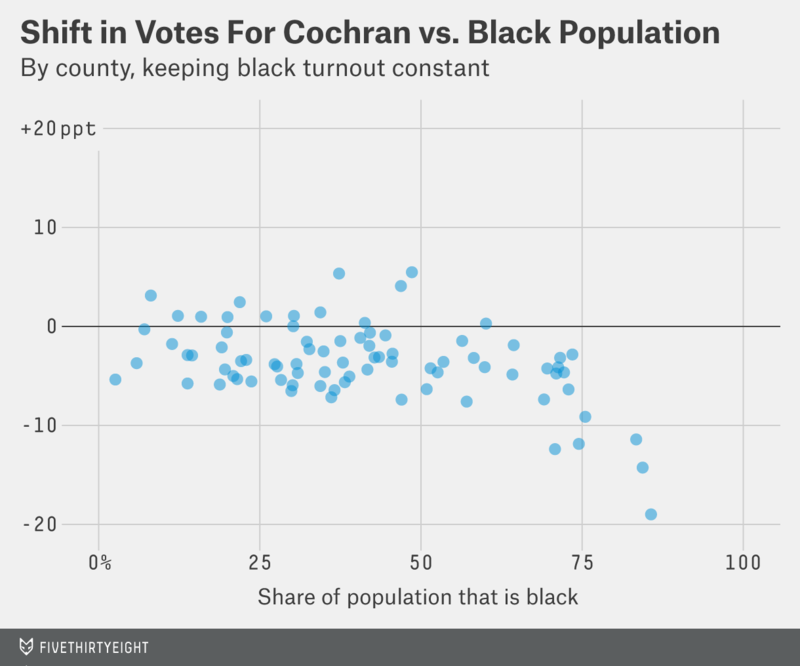 The analysis here suggests that Cochran may very well have won because he was able to get traditionally Democratic voters to cast their ballots for him.